Bishop Morlino joined what looked to me about 500 Madison Catholics last night for the first in a series of Capitol Rosary Rallies. A beautiful evening. The bishop spoke very briefly, explaining what we were doing was entirely not political. Fr Isaac Mary Relyea then led us in 15 decades of the Rosary, the traditional Joyful, Sorrowful, and Glorious Mysteries, offered for life, family, and the conversion of the world. The rosary was followed by the Prayer for the Protection of Religious Freedom, led by Fr Rick Heilman, which may be found on the USCCB’s Fortnight For Freedom main page. I breathed a sigh of relief when I found my camera battery was dead, so I could just concentrate on prayer. Syte Reitz has written a blog post about the rally with her photos and an audio download of the rally. Her son Tom was also there taking pictures which are always lovely! The Wisconsin Reporter has an interesting article, from a political angle in spite of Bishop Morlino’s introductory words and the fact we merely prayed the rosary and a prayer for religious freedom, and there were really no speeches. It was a familiar scene in Madison Thursday night. Hundreds of protesters gathered on the steps at the Capitol, some wearing T-shirts with a clenched fist. But this time, enclosed in the clenched fists were rosary beads. It wasn’t a recall rally, but a demonstration with a conservative feel – led by Catholics who believe religious liberty is under attack. “We came here to pray hard that the Lord will continue to help us to defend our own religious freedom and our freedom of conscience when those are somehow endangered,” said [Bishop] Morlino. Constance Nielson, dean of faculty at St. Ambrose Academy in Madison takes issue with the characterization [that Catholics struggle to reconcile sanctity of life and social justice], arguing the dignity of life and social justice are a natural fit. 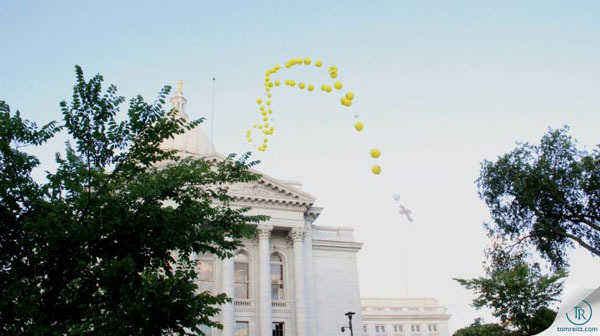 Oh, and there was a pro-life Balloon Rosary released at the end of the rally, which floated gracefully past the Capitol dome! I LOVED it! 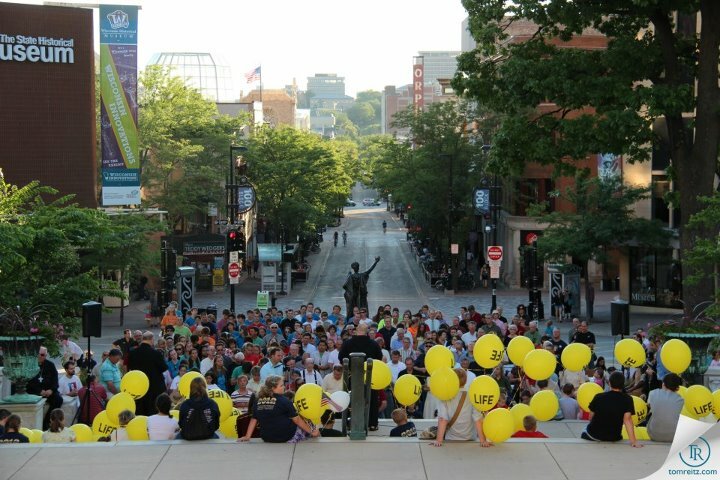 And these Rosary Rallies will be weekly, every Thursday at 7pm right at the Capitol, through November 1st! Please join us! And take a look at the whole schedule of Diocesan Fortnight for Freedom events. Oh well, it was a great time of prayer for all of us. I suppose we shouldn’t really expect the secularists to understand what we are doing until the Grace of Our Lord fills their souls with the light of Faith. May our prayers bring about many conversions through the intercession of our Blessed Mother! Your corrections to their article are on target, though I don’t think the errors necessarily have to do with hating the Catholic Church. Their phrase “American Catholic Church” also jumped out at me since as you note that is the name of a schismatic church. The main thing they get wrong, though, is the fact that praying the rosary is actually prayer to God and not politics, I wonder if their reporter arrived late, since Bishop Morlino stated very clearly at the beginning that it was not a political event. Indeed, perhaps not hatred of the Church, but certainly ignorance of the Faith. If a writer cannot differentiate between the one Roman Catholic Church and a tiny schismatic congregation, how can we expect him to differentiate between prayer and politics? He will undoubtedly view this event in light of his secularist (or, at least, non-Catholic) paradigm. To the secular world, if a large group of people gathers together in the public square, it is almost always for some sort of political demonstration. The concept of prayer is (regrettably) foreign to such souls. Hence the need to pray to Our Lady constantly for more conversions to the true Faith. That was my point: that we should not expect secularists to be able to discriminate between political demonstration and prayer without the assistance of Grace, no matter how many times His Excellency insists that we are not gathered for a political motive. The majority of people do not, in fact, hate us or the Church; they simply misunderstand what we believe and do as Catholics. I did, however, witness sincere hatred of the Church that evening as well, when two young gentlemen walking behind me were uttering some of the most horrendous blasphemies against Our Lady and the holy priesthood I have ever heard. May the Lord have mercy on them. Let us get a thousand people there Thursday, July 5, 2012.